In India, approx 12 million people are being added to the workforce every year. This means, young, educated & aspirational workforce is moving from villages to towns and from towns to cities in search of better job opportunities. In economic language, this phenomenon is known as urbanization. Urbanization in India is growing at a rapid pace. Estimates suggest that by the year 2030, the urban population of India will reach 600 million. In recognition of the crying need for housing & in view of rapid rate of urbanization, the Government launched the Pradhan Mantri Awas Yojana (PMAY). This scheme is a part of the Government’s ambitious “Housing for All” scheme that aims to ease the demand for housing in cities by building 20 million houses by the year 2022. The PMAY has been framed considering the constraints of the urban poor and the middle-income group in mind. These are individuals who dream of having a house of their own, but are often unable to do so because of the lack of resources and their inability to obtain a loan at an affordable home loan interest rate. To address this particular issue, the Government introduced the Credit-Linked Subsidy Scheme (CLSS) for the people belonging to Middle Income Group (MIG). Also read Affordable Housing in India in afinoz’s blog section. For convenience, the MIG has been subcategorized as MIG I and MIG II. Households having an annual family income of Rs 6 to 12 lakhs fall under MIG I whereas, households with an annual income of Rs 12- 18 lakhs fall under MIG II. Families who fall in the MIG I and MIG II category can avail of the Credit-Linked Subsidy Scheme (CLSS). CLSS for MIG I is available for either the construction or repurchase of a house with a carpet area of up to 90 sq mts. For the MIG II category, the limit is up to 110 sq mts. This scheme is applicable to families where none of the members have a house that is in their name. Under CLSS, beneficiaries of the MIG I category are eligible for a 4% interest subsidy on a 20-year loan of up to Rs 9 lakhs. MIG II beneficiaries can avail of a 3% interest subsidy on a 20-year loan of up to Rs 18 lakhs. Therefore for a loan of up to Rs 9 lakh, the interest subsidy works out to be Rs 2.44 lakhs whereas, for a loan up to Rs 12 lakhs, the interest subsidy works out to be Rs 2.48 lakhs per beneficiary. The total subsidy amount if applicable is paid upfront to the beneficiaries thus making home loans affordable for the first time homebuyer. The CLSS under the PMAY can, therefore, fulfill the home owing dreams of many a first time home borrower. But the question that careful borrowers are likely to ask is whether or not it is possible to avail of CLSS benefits and get a loan without CIBIL check. The good news for such borrowers is that the PMAY has been formulated considering the constraints of the aspiring home buyers in mind. Since such benefits are particularly targeted towards lower and middle-income groups, it is likely that a credit score will not play a very big role in the assessment of your creditworthiness. However, if you are still worried about a credit score, you are better off by applying through a non-traditional lender like a Non-Banking Finance Company (NBFC), a small finance bank or even regional rural banks and urban co-operative banks rather than large commercial banks. This is because non-traditional lenders and smaller banks have other tools of credit assessment and are likely to give minor attention to your CIBIL score. In fact, even if you are a first-time borrower, with no previous CIBIL record, it will be possible for you to get a loan without credit score check under PMAY. Availing of such a loan and making regular repayments on the same can, in fact, help you build a good credit record and make you more credit worthy in the future. In the current scenario, more and more real estate developers are concentrating on affordable housing projects that fulfill the requirements of housing under PMAY. Further with the strengthening of the real estate sector with the introduction of GST (Goods & Service Tax) and RERA (Real Estate Regulatory Authority), things are going in favor of the aspiring home owner. With the supportive CLSS benefits under PMAY, affordability is only expected to improve here on. 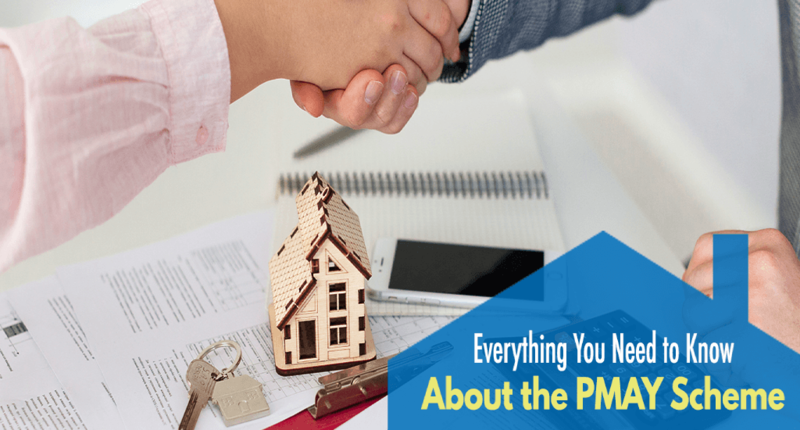 Thus if you have been contemplating the purchase of your first property, but are worried about home loan interest rates, now is the time to check out your eligibility under PMAY. To explore best home loan schemes & avail benefits of PMAY from different lenders, log on to www.afinoz.com or mail us at info@afinoz.com We are here to serve you the best financial products without any hassles.